The 2018 State Fair of Texas is fast approaching, and news is still breaking about ridiculous deep-fried delicacies and absurd mashups that will grace the fair this year. Eater’s already reported about cotton candy tacos and deep-fried arroz con leche, but it is the Kool-Aid Pickle Sangria that caught our attention!! 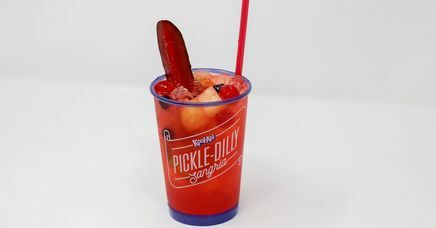 Kool-Aid Pickle Dilly Sangria: This drink improbably combines fruit punch-flavored Kool-Aid with a pickle juice recipe, white wine, and lemon-lime soda — garnished with a Kool-Aid soaked pickle spear.